Copyright: © 2016 Chatterjee T, et al. This is an open-access article distributed under the terms of the Creative Commons Attribution License, which permits unrestricted use, distribution, and reproduction in any medium, provided the original author and source are credited. Anaemia affects 24.8% of the population worldwide. It has wide variety in terms of clinical manifestation of the disease severity. It can also ranges from almost asymptomatic to severe haemolytic anaemia. In contrast to all other nucleated cells, RBCs show very interesting biology. An alteration in any of the major factors in RBCs (eg. shape, size, and structural or functional or quantitional abnormalities in haemoglobin) usually results in compensatory changes in the other compensatory factors. Sometimes, the compensatory responses may fail because of severity of disease or due to underlying pathologic conditions. The result of failed compensatory responses is cellular dysfunction, tissue hypoxia and eventual cell death, which ultimately leads to severity in anaemia and emergency situations due to it. 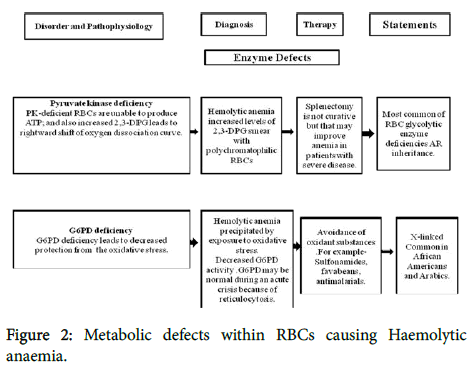 In this paper, we have concentrated to focus on how the extrinsic and intrinsic defects on RBCs cause severe haemolytic anaemia, leading to emergencies. We have also discussed the destructions of RBCs in both extra and intra vascular regions, contributing to severe haemolysis. Other than haemolytic anaemia, other structural and functional defects of haemoglobin, which can lead to life threatening conditions (e.g. : β thalassemia major and transfusion dependent haemoglobinopathies) are also being discussed here. In nutshell, this paper is an exclusive review on all forms of clinical emergencies due to anaemia’s and other haemoglobinopathies. Anaemia is defined by an absolute decrease in the number of red blood cells (RBCs), circulating in the blood. The diagnosis of anaemia is based on the laboratory measurements of RBC indices. If that found to fall below accepted normal values (Table 1) , then it is considered as anaemia. Table 1: Normal values of RBC indices. In worldwide scale, anaemia affects 24.8% of the population. It is more prevalent in children and pregnant women , than the adult men and women. It is also seen to be more prevalent in women than men. The prevalence of anaemia varies depending on the RBC indices used to define it. Anaemias in most cases are chronic, but it can also give rise to emergency in some special cases or clinical conditions. It can be presented as an emergency is mainly due to some clinical causes like acute blood loss or more rarely acute haemolysis or marrow involvement by hypoplasia or malignancy. More chronic types of anaemia can also be presented as an emergency, when the Haemoglobin (Hb) level falls to much lower than the normal level (Table 1), whereby the patient him or herself develops symptoms or when other disorders, e.g. myocardial insufficiency or respiratory disease co-exist. The pluripotent stem cells of bone marrow differentiate into erythroid, myeloid, megakaryocytic and lymphoid progenitors. Erythropoietin stimulates the growth and differentiation of erythroid progenitors, resulting in production of RBCs. When the normoblast extrudes its nucleus, it retains its ribosomal network, which identifies the reticulocyte. The reticulocyte keeps its ribosomal network for approximately four days, three of which are normally spent in the bone marrow and remaining one in the peripheral circulation. The RBC develops as the reticulocyte loses its ribosomal network, and the mature RBC circulates for 110 to 120 days. The old erythrocytes are destined for phagocytosis by macrophages that can detect senescence signals. Under steady-state conditions, the rate of RBC production is equal to the rate of RBC destruction, resulting the constant amount of production of RBCs. The mass of RBCs remains constant because equal numbers of reticulocytes replace the destroyed senescent erythrocytes . Anaemia often can stimulate the erythropoiesis, mainly controlled by the hormone erythropoietin. Erythropoietin is a glycoprotein, produced primarily in the kidney. It regulates the differentiation of the committed erythroid stem cell and thereby controlling the production of RBCs. Tissue hypoxia and by products of RBC destruction pathway stimulates the erythropoietin production. Erythropoietin levels are found to be elevated in many types of chronic anaemia . RBCs are in fact the most interesting cells to follow, in biology. The physiological and biochemical processes within RBCs are markedly different from that of all other nucleated cells in our system. The major function of the RBCs is oxygen and carbon dioxide transport. RBCs transport oxygen from the lungs to the tissues and transport carbon dioxide in the reverse direction. Oxygen transport is directly influenced by the amount of haemoglobin, its oxygen affinity and flow rate of blood. An alteration in any of the major factors usually results in compensatory changes in the other factors. For example, a decrease in haemoglobin is compensated by both chronotropic and inotropic cardiac changes, which can result the increase in blood flow and decrease in haemoglobin affinity at the tissue level. This will ultimately allow the release of more oxygen in the tissue places. Sometimes, these compensatory responses may fail because of severity of disease or due to underlying pathologic conditions. The result of failed compensatory responses is cellular dysfunction, tissue hypoxia and eventual cell death, which ultimately leads to severity in anaemia. A Haemolytic process must be suspected in any individual with evidence of RBC damage or change in shape, size or appearance e.g. sickle cells, spherocytes, reticulocytosis (may increase the MCV), fragmented cells (appearance in the blood film), nucleated RBCs, polychromasia and raised un-conjugated bilirubin. Family genetic history, racial origin, drug history and exposure to certain chemicals can often found useful for analyzing the root of the disease. Common sites of unrecognized blood loss from trauma include the peritoneal, pleural, pelvic, and retroperitoneal spaces. In addition to trauma, risk factors for blood loss include acquired and hereditary abnormalities to platelets and the coagulation system. When blood loss is more than 40% of total volume, the patient may lose consciousness. With chronic anaemia, a hyper-dynamic heart, with a prominent point of maximal impulse (PMI) often present. Advanced trauma life support classifies shock into four distinct levels. Specific clinical findings are associated with each level. Class I is represented by less than 15% blood loss. Mild tachycardia may be present, but blood pressure is usually remains normal in this category of trauma. In class II, blood loss is usually 15-30%. Tachycardia, tachypnea, and decreased pulse pressure are also seen as associated symptoms in class II trauma. If, 30-40% blood gets out of the body, then it usually falls under Class III trauma. It always leads to a measurable decrease in blood pressure as well as a significant tachycardia and a narrow pulse pressure. Class IV category of trauma is categorized for more than 40% blood loss. It leads to patient demise unless prompt resuscitative measures are taken. Marked tachycardia and significantly decreased blood pressure are common findings. Blood losses greater than 50% leads to loss of pulse and blood pressure. Urinary output is decreased in class III trauma and is negligible in class IV trauma. Patients with exacerbations of chronic anaemia occasionally may present with signs and symptoms of congestive heart failure. This is especially true for the elderly persons, who are more likely to take anticoagulants and anti-platelet agents [4,5]. In non-traumatic situations of blood loss, the retroperitoneal space, gastrointestinal tract, peritoneal space, and pelvis must be considered . Causes other than blood loss may be responsible for severe anaemia of rapid onset. Rare Haemolytic conditions can cause rapid destruction of RBCs. More commonly, patients with chronic compensated Haemolytic anaemia (eg. sickle cell disease, some thalassaemia etc.) have more clinically stable anaemias. Beyond red cell destruction and production, the status of haemoglobin function must be considered, because there are some inherited (eg. thalasssaemia) and acquired (eg. carbon monoxide etc.) conditions, which directly influence the ability of haemoglobin to transport oxygen either by causing structural changes due to mutations (eg. thalassaemias) or by making undesired complexes with haemoglobin (eg. gas poisoning). Impaired haemoglobin transport of oxygen is seen in patients with carbon monoxide poisoning. Cyanohaemoglobin from cyanide, methaemoglobinemia from nitrates and sulfhaemoglobinemia resulting from hydrogen sulfide can severely decrease functional haemoglobin. These patients often present with symptoms associated with anaemia, such as fatigue, shortness of breath, altered mental status and other clinical manifestations of hypoxia, but without signs of RBC loss or volume depletion . There are many causes of haemolytic anaemia. Destruction of RBCs can take place at both extra-vascular (at tissue places) and intra-vascular (within the vascular network of blood flow) region. There are many different intrinsic and extrinsic causes of RBCs destruction, starting from structural and functional abnormalities of haemoglobin, the major oxygen transporter protein of RBC (eg. haemoglobinopathies including thalassaemia and sickle cell disease) to infection. 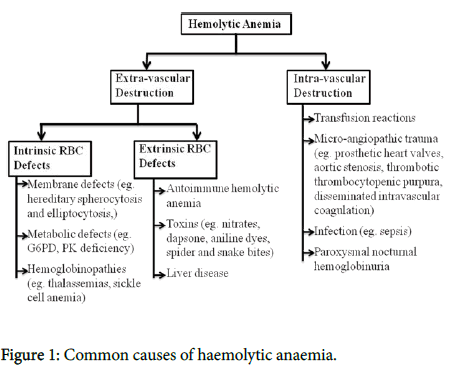 The external and internal causes of Haemolytic anaemia are classified in Figure 1. Figure 1: Common causes of haemolytic anaemia. Intrinsic abnormalities of RBC are the condition, in which abnormal red blood cells are the result of problems within the cells themselves. This typical Haemolytic anaemia mainly caused by mutation of genes that encodes skeletal and cell membrane haemoglobin or proteins. Defective haemoglobin or proteins cause RBC abnormalities that predispose RBC to accelerated haemolysis. These abnormalities present as intrinsic Haemolytic anaemia. There can be either membrane or metabolic defects within the RBCs or structural or functional defects associated with haemoglobin, the major structural protein of RBC. Membrane defect: There are many abnormalities associated with membranes of RBCs, which can ultimately lead to severe Haemolytic anaemia. Examples include Hereditary Spherocytosis and elliptocytosis. Hereditary Spherocytosis (HS) is a familial Haemolytic disorder that affects red blood cell membrane proteins. The red blood cells are those which carry oxygen around the body. Their shape (a slightly elongated saucer) helps them to carry oxygen effectively. In Hereditary spherocytosis there is a defect in the outer layer of the red blood cell. That means the cell is not the usual shape. Spherocytosis means more sphere-shaped and this also makes it more fragile than usual. With clinically severe Hereditary spherocytosis, splenectomy is the standard treatment for patients, but can be deferred safely in patients with mild uncomplicated HS (haemoglobin level >11 g/dL). Splenectomy that usually results in full control of HS, except in the unusual autosomal recessive variant of the disorder . Hereditary elliptocytosis (ovalocytosis) is a rare autosomal dominant disorder in which RBCs are elliptical or oval or are poikilocytic and bizarrely shaped . These disorders are clinically, genetically, and biochemically heterogeneous . Hereditary elliptocytosis, that is due to defects in either the structure or quantity of the cytoskeletal proteins which is responsible for maintaining the biconcave morphology of RBCs. Mutations in either alpha- and beta-spectrin are most commonly responsible, but mutations in other cytoskeletal proteins (band 4.1 and glycophorin) are also described . Metabolic defect: Metabolic defects within RBCs can also contribute to Haemolytic anaemia. Glucose-6-phosphate dehydrogenase deficiency (Shunt pathway) and pyruvate kinase deficiency (Embden- Meyerhof pathway) can lead to Haemolytic anaemia (Figure 2). Figure 2: Metabolic defects within RBCs causing Haemolytic anaemia. Haemoglobin defect: The structural and functional abnormalities to the major oxygen transporting protein of RBC (haemoglobin) can also lead to Haemolytic anaemia. Structural defects of RBCs include HbS, HbC, HbE and other unstable haemoglobins, whereas the synthesis defects leads to thalassaemia syndromes. The thalassemia syndromes are inherited of autosomal recessive gene disorder caused by impaired synthesis of one or more globin chains .In the alpha (α)-thalassemias, there is absent or decreased in the production of α-globin subunits, whereas in the beta (β)-thalassemias, there is absent or reduced in the production of β-globin subunits . Rare thalassemias affecting the production of delta (δ)- or gamma (γ)-globin subunits are not clinically significant disorders. Combined deficiency of δ + β-globin subunits, or of all of the β-like globin subunits also occurs . Alterations in the gene for one of the two haemoglobin subunit chains, alpha (α) or beta (β), are called the mutations. Often, the mutations change a single amino acid building block in the subunit alpha (α) or beta (β). Most commonly the change is innocuous, that perturbing neither the structure nor function of the haemoglobin molecule. Occasionally, alteration of a single amino acid dramatically disturbs the behavior of the haemoglobin molecule and produces a disease state. Haemoglobin S is the predominant haemoglobin in people with sickle cell disease. The alpha chain is normal. The disease-producing mutation exists in β chain that gives the molecule structure (α2βS2). People who have one sickle mutant gene and one normal beta gene have sickle cell trait which is benign. Haemoglobin C results from a mutation in the β globin gene and that is the predominant haemoglobin found in people with haemoglobin C disease (α2βC2). Haemoglobin C disease is relatively benign and producing a mild Haemolytic anaemia and splenomegaly. Haemoglobin C trait is benign. Haemoglobin E is the one type of variant that results from a mutation in the haemoglobin beta chain. Haemoglobin E trait is benign. Haemoglobin E is mostly common in South East Asia and in some areas equals haemoglobin-A in frequency. Unstable haemoglobins arise as a result of the synthesis of structurally abnormal globin chains, that usually with single amino acid replacements but occasionally with amino acid insertions, deletions, or truncated or extended chains. Extrinsic abnormalities of RBC are the abnormalities of the red blood cells that are mostly due to a disorder, disease or condition outside of the red blood cells themselves. Extrinsic Haemolytic anaemia is often due to immune mechanisms, as in warm and cold agglutinin Haemolytic anaemia. However, there are many non-immune causes, which includes systemic diseases, mechanical destruction (i.e, fragmentation haemolysis), and also increased the destruction within an enlarged spleen (hypersplenism), and the action of toxins and drugs. Autoimmune haemolytic anaemia: Autoimmune haemolytic anaemia is a group of disorders which is characterized by a malfunction of the immune system that produces autoantibodies, which attack the red blood cells as if they were substances foreign to the body. The lifetime of the RBCs is reduced from the normal 100– 120 days to just a few days in serious cases [13,14]. Haemolytic disease of the newborn (HDN) – also called erythroblastosis fetalis. It is a blood disorder that occurs when the blood types of a mother and baby are incompatible  HDN used to be a major cause of fetal loss and death among newborn babies. It occurs when baby's red blood cells break down at a fast rate. The most common form of Haemolytic disease of the newborn is ABO incompatibility, that is usually not very severe. Other, less common types may cause the more severe problems.The least common form of HDN is Rh incompatibility, which can almost always be prevented. If this form does occur, it can cause very severe anaemia in the baby. Liver disease: Red cell fragments are especially formed when the fibrin strands come in contact with the circulating red cells. The strands are cut a small piece from the original cell. Several descriptive names have been used for fragmented red cells, depending on the resulting shape of the fragment. Those includes pre-keratocyte(blister cell), schistocyte (more of a catch-all term),and keratocyte (horn cell or helmet cell). There are many causes of Haemolytic anaemia. When destruction of RBCs take place at intra-vascular (within the vascular network of blood flow) network, that are considered as Intra-vascular Haemolysis. Transfusion reactions: Transfusion reactions are very important, that the blood is accurately matched to the doner and recepient type. If the blood type does not a match, it can produce severe transfusion reaction. These reactions are mostly rare, but they can affect the kidneys and lungs (Figure 3). 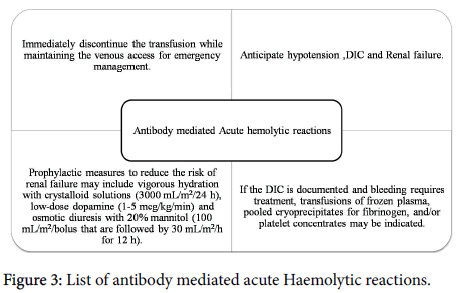 Figure 3: List of antibody mediated acute Haemolytic reactions. Antibody-mediated: Blood group incompatibility: Blood types are categorized by A, B and O. It has also Rh factor of positive or negative. A-B-0 and Rh incompatibility happens when a mother’s blood type conflicts with that of her new-born child. It is possible for a mother’s red blood cells to cross into the placenta or fetus during the pregnancy. When this basically occurs, the mother’s blood cells develop the antibodies that can attack the new-born and cause the jaundice. The risk of that is highest near or during delivery. Rh- mother if gives birth to 2 consecutive Rh+ child, then in the 2nd pregnancy the fetus is affected by the antibodies already present in the mother, which is known as erythroblastosis foetalis. Haemolytic blood transfusion reaction: A Haemolytic transfusion reaction is a serious complication that can occur after the blood transfusion. The reaction that occurs when the red blood cells that were given during the transfusion are destroyed by the person's immune system. There are many type of blood groups in the human population that includes ABO, Rh, Kidd, Kell, Duffy, MNS and Lewis. The most important of these blood groups are ABO and RhD and Kell. Transfusion with ABO incompatible blood can lead to severe and potentially fatal transfusion reactions. RhD, that is highly immunogenic and also can lead to red cell haemolysis in certain settings. Antibodies that target the Kell antigens can cause transfusion reactions and Haemolytic disease of the newborn (HDN). In the case of Haemolytic disease of the new-born, ABO and Rh incompatibility are more common causes. ABO blood group,that is the most important of all the blood group systems. There are four different type of ABO blood groups, that determined by whether or not an individual's red cells carry the A antigen, the B antigen, both A and B antigens or neither. The most significant Rh antigen is the RhD. If RhD is present on the red cell surface, the red cells are called RhD positive. Approximately 80% of the Australian population are RhD positive. The remaining 20% of the population that lack the RhD antigen which are called RhD negative. Antibodies to RhD develop only after an individual is exposed to RhD antigens via pregnancy,transfusion or organ transplantation. Anti RhD (anti-D) antibodies destroy RhD positive red cells and that can lead to haemolytic transfusion reactions. It is of particular importance in the pregnancy where the anti-D antibodies can cross the placenta from mother to unborn child and also lead to haemolytic disease of the newborn. The Kell blood group system is a complex and contains many antigens that are highly immunogenic. Those antigens are the third most potent, after those of the ABO and Rh blood groups, at triggering an immune reaction (Figure 4). 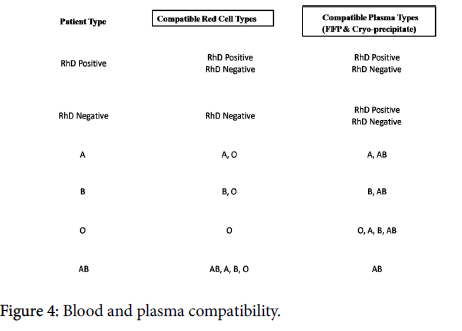 Figure 4: Blood and plasma compatibility. Micro-organopathic trauma: Micro-organopathic trauma inclues thrombotic thrombocytopenic purpura, Haemolytic uremic syndrome, Pre-eclamptic toxemia (PET), meningococcal septicemia etc. Thrombotic thrombocytopenic purpura (TTP) that is a blood disorder that causes blood clots to form in small blood vessels. This leads to a low platelet count (thrombocytopenia). Haemolytic uremic syndrome (HUS) is a condition that results from the abnormal premature destruction of the red blood cells. If this process begins, then the damaged red blood cells start to clog the filtering system in the kidneys that may eventually cause the life-threatening kidney failure associated with Haemolytic uremic syndrome. Pre-eclamptic toxemia (PET) is also called Toxemia of Pregnancy or Pregnancy induced hypertension.This syndrome develops after the 20th week of pregnancy. Disseminated intravascular coagulation is a one type of serious disorder in which the proteins that control blood clotting become overactive. This can reduce blood flow and also can block blood from reaching bodily organs. As the condition progresses, the platelets and clotting factors in blood are used up, and it will begin to experience excessive bleeding. Meningococcal septicemia is the blood poisoning form of the disease and also it is the more life threatening form of the disease and more dangerous when there are no signs of meningitis. Infections: Infection can also cause the RBC haemolysis. The common infections include Plasmodium falciparum , Clostridium welchii , Mycoplasma pneumonia etc. Plasmodium falciparum is the protozoan parasite, and one of the species of Plasmodium that can cause malaria in humans. It is transmitted by the female Anopheles mosquito. Malaria caused by this species (also called malignant or falciparum malaria) is mostly dangerous form of malaria, with the highest rates of complications and mortality. Clostridium welchii type A is the most common agent of food poisoning when allowed to proliferate to the large numbers in cooked foods, usually meat and poultry. The main factors are survival of the spores, frequently found on the raw products, through the cooking process and possible contamination of cooked meats transferred to the unclean containers; subsequent germination of spores and also the rapid multiplication of the vegetative cells during long slow cooling and non-refrigerated storage lead to the heavy contamination. The toxin responsible is different from the soluble antigens, and its formation in the intestine which is associated with sporulation. Mycoplasma pneumonia is an infection of the lungs by the bacteria Mycoplasma pneumonia and also a common cause of community-acquired pneumonia and the disease usually has a prolonged, gradual onset . The disease spreads very easily through contact with respiratory fluids, and it causes regular epidemics. Infectious mononucleosis is an infection usually caused by the Epstein-Barr virus. This virus spreads through saliva that is why it sometimes called "kissing disease." Mono occurs most often in teens and young adults. Infectious mononucleosis was first described by Sprunt and Evans in the Bulletin of the Johns Hopkins Hospital in 1920 . Paroxysmal nocturnal haemoglobinuria: Paroxysmal nocturnal haemoglobinuria is a rare disease in which red blood cells break down earlier than normal. This disease is characterized by the destruction of red blood cells (Haemolytic anaemia, impaired bone marrow function), blood clots (thrombosis) and a 3 to 5% risk of the developing leukaemia. Paroxysmal nocturnal haemoglobinuria (PNH) is an acquired clonal disorder in which the intravascular haemolysis results from the somatic mutation of the totipotent stem cells, causing an intrinsic defect in the red cell membrane . March haemoglobinuria: March haemoglobinuria haemolysis caused by repeated uncushioned shocks or trauma to some boy part, such as in some soldiers on long marching, in marathon running, and in karate practitioners. Patients with a compensated Haemolytic process require no treatment. Folic acid 5 mg daily is given life-long in those with symptomatic Haemolytic disorders. Therapeutic approaches to treat anaemia include blood and blood products, hormonal/nutritional therapies, immune-therapies and adjunctive therapies. The aim of the therapy in acute anaemia is to restore the hemodynamics of the vascular system and to replace lost red blood cells (RBCs). Mineral and vitamin supplements, vasopressors, blood transfusions, glucocorticosteroids and histamine (H2) antagonists are generally used to achieve this. Correction of acute anaemia often requires blood, blood products, or both. Transfusion of blood alone is insufficient if there is significant on-going haemolysis or haemorrhage. But providing transfusion timely to restore haemoglobin to safe levels can prevent major complications of acute anaemia. Although RBC transfusion is the quickest way to raise the haemoglobin concentration, that benefit must be balanced against the significant complications associated with transfusion. Multiple studies have reported worse outcomes (e.g. higher morbidity and mortality rates) in transfused patients compared with non-transfused or less-transfused patients. Whole blood contains RBCs, platelets, and coagulation factors. But the whole blood is rarely used as a treatment option, as every patient does not need all the components of the blood. So, a given blood of a single donor can be separated in components and can serves the purpose of more the one patients. Packed red blood cells (PRBCs) are the remaining components of whole blood after the platelets and plasma are removed. Each unit of PRBCs is expected to raise the haematocrit (Hct) level by 3. There are associated complications with the use of blood and blood products. Blood products have the potential to transmit bacterial and viral diseases too. Bacterial or viral contamination is the most common infectious risk of blood transfusion. Immunological responses are also associated with blood transfusion. So, washed packed cells used for patients with lesser immunological tolerance level. Other complications of transfusion therapy include volume overload, allergic reactions, anaphylaxis, hypothermia, hypocalcaemia and disseminated intravascular coagulation (DIC). If transfusion cannot be given due to other associated clinical situations, erythropoietin and iron supplements in the sub-acute phase may be beneficial. Currently, research is on-going to evaluate the effectiveness of inorganic compounds, such as dodecafluoropentane emulsion (DDFPe) as a blood substitute. It (DDFPe) is an inorganic fluorocarbon compound, which expands at body temperature and has a strong affinity for oxygen . Poly-Heme is an oxygen-carrying blood substitute made from human blood , which can be an excellent option for those willing to receive human-blood–derived products. The advantages of Poly-Heme are that, it has shelf life of more than 1 year, does not require cross-matching and has virtually no risk of transmitting infections. Other blood substitutes are also under research, including hyper viscous plasma expanders such as polyethylene glycol conjugate albumin . Timothy G, Roy L, Scott D (2013) Anemia In The Emergency Department: Evaluation And Treatment. Emerg Med Pract. De Benoist B, McLean E, Egli I, Cogswell M (2008) Worldwide prevalence of anaemia 1993-2005. World Health Organization Library. Kaushansky K, Beutler E, Lichtman MA, Kipps TJ, Prchal JT, et al. (2011) Williams Hematology (8thedtn). New York: McGraw Hill Medical. Gage BF, Fihn SD, White RH (2001) Warfarin therapy for an octogenarian who has atrial fibrillation. Ann Intern Med 134: 465-474. Anderson FA, Wheeler HB, Goldberg RJ, Hosmer DW, Patwardhan NA, et al. (1991) A population-based perspective of the hospital incidence and case-fatality rates of deep vein thrombosis and pulmonary embolism. The Worcester DVT Study. Ann Inter Med 151: 933-938. Levine MN, Raskob G, Landefeld S, Kearon C (2001) Hemorrhagic complications of anticoagulant treatment. Chest 119: 108S-121S. Janz TG, Hamilton GC (2010) Anemia, polycythemia, and white blood cell disorders. In: Marx JA, Hockberger RS, Walls RM (eds). Rosen’s Emergency Medicine Concepts and Clinical Practice. PA: Mosby Elsevier. Abdullah F, Zhang Y, Camp M, Rossberg MI, Bathurst MA, et al. (2009) Splenectomy in hereditary spherocytosis: Review of 1,657 patients and application of the pediatric quality indicators. Pediatr Blood Cancer 52: 834-837. Gallagher PG, Jarolim P (2000) Red cell membrane disorders. In: Hoffman R, Benz EJ, Shattil SJ (eds). Hematology Basic Principles and Practice. Churchill Livingstone. Da Costa L, Galimand J, Fenneteau O, Mohandas N (2013) Hereditary spherocytosis, elliptocytosis, and other red cell membrane disorders. Blood Rev 27: 167-178. Harper SL, Sriswasdi S, Tang HY, Gaetani M, Gallagher PG, et al. (2013) The common hereditary elliptocytosis-associated a-spectrin L260P mutation perturbs erythrocyte membranes by stabilizing spectrin in the closed dimer conformation. Blood 122: 3045-3053. Forget BG, Bunn HF (2013) Classification of the disorders of hemoglobin. Cold Spring Harb Perspect Med 3: a011684. Sawitsky A, Ozaeta PB Jr (1970) Disease-associated autoimmune hemolytic anemia. Bull N Y Acad Med 46: 411-426. Shoenfield Y, Cervera R, Gershwin ME (2008) Diagnostic Criteria in Autoimmune Disease. "Erythroblastosis fetalis" at Dorland's Medical Dictionary. McCormack WM (2005) Infections due to Mycoplasmas. In: Kasper DL, Braunwald E, Fauci AS (eds). Harrison's Principles of Internal Medicine. New York: McGraw-Hill. Chrobák L (2000) Paroxysmal nocturnal hemoglobinuria (membrane defect, pathogenesis, aplastic anemia, diagnosis). Acta Medica (Hradec Kralove) 43: 3-8. Alayash AI, D'Agnillo F, Buehler PW (2007) First-generation blood substitutes: what have we learned? Biochemical and physiological perspectives. Expert Opin Biol Ther 7: 665-675. Jahr JS, Varma N (2004) PolyHeme. Northfield Laboratories. IDrugs 7: 478-482. Tsai AG, Vázquez BYS, Cabrales P, Kistler EB, Tartakovsky DM, et al. (2014) Replacing the Transfusion of 1-2 Units of Blood with Plasma Expanders that Increase Oxygen Delivery Capacity: Evidence from Experimental Studies. J Funct Biomater 5: 232-245.